AFC Bournemouth had their chances but one defensive lapse cost them and they were then caught out late as they fell to a 2-0 defeat to Everton at Goodison Park. The Cherries made a good start and could have led after David Brooks rolled a shot onto the inside of the far post, the woodwrok flicked at the other end when Michael Keane's header drifted onto the top of the crossbar. Into the second half and the Toffees were ahead, Kurt Zouma nodding home following a corner, and while the away side renewed their attempts for a goal were unable to turn promising positions into that crucial strike as they dropped to defeat where they had displayed plenty of positives. To add insult in injury time, substitute Dominic Calvert-Lewin made the most of gaps at the back as he strode onto a centre and buried his shot home at the near post to add a second with the final action of the match. There was team news in both full-back positions when the away team was announced, Adam Smith returning from injury to start on the left while it was a Premier League bow on the right. In attack Callum Wilson couldn't shake his hamstring complaint off and didn't make the matchday squad. Kicking-off in the white-navy-navy away strip, the Cherries soon threatened when Ryan Fraser made room to cross low, Junior Stanislas just having the ball taken off his toe as he looed to shoot. An open beginning and Fraser was soon the architect again as he speared in a second low centre, King was there to meet it but couldn't get a proper connection from six yards and Jordan Pickford was able to dive onto the loose ball. Brooks appeared to have won a penalty when he was brought to ground by Idrissa Gueye, referee Anthony Taylor signalling that the Everton had won the ball. Next, Jefferson Lerma struck a low effort wide from distance and in the following possession Brooks went closer still, Stanislas feeding through and the 21-year-old beating the offside line and Pickford but not the far post with his finish. The Cherries attacks continued and when Smith was felled Stanislas had the chance for a trademark free-kick, his strike dipping and bouncing in front of Pickford, who palmed the slippery ball around post, the rain starting to fall heavily on Merseyside. There was a audible nervousness from the home fans around Goodison, groans emanating as the Cherries repeatedly recovered the ball, though Bernard had a chance which he headed well over after Ademola Lookman's right-wing sprint. 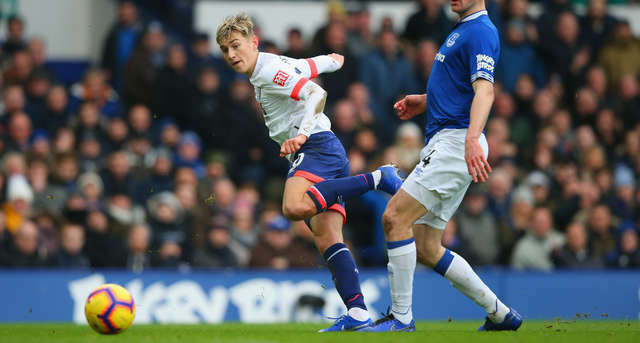 A Fraser cross hit Lucas Digne's flapping hand in the box unspotted, but Everton were causing danger of their own ahead of the interval; left-back Digne's centre flicked on by Keane and clipping the edge of the woodwork on its way behind. Following the restart the Toffees were on the frontfoot, only a miraculous goal-line clearance from Nathan Ake keeping out Richarlison's close-range strike, the whole ball not over the line. Steve Cook - in a similar fashion to Keane in the first half - put a skimmed header onto the roof of the goal, though on the hour Everton took the lead. A recycled cross following a home corner saw Digne's delivery falling for the unmarked Zouma at the near post, the central defender beating Asmir Begovic to the ball and planting his header into the top corner. King profited from a Keane error and burst towards the box, letting fly with a fierce shot and rippling the side of the Everton goal netting, the wrong side of it from a visiting perspective. However, the away pressure was beginning to build. Ake won a header at the back post from a Brooks corner but was unable to engineer the power to trouble Pickford, while from the 'keeper's clearance Richarlison headed wide. The heavy rain returned in the closing minutes, Bournemouth throwing the kitchen sink at their opponents in search of a goal. Fraser was just beaten to a through ball by Pickford, substitute Lys Mousset then missing a low cross by a whisker. Five minutes were added on and Mousset's smart prod forwards saw Gosling striding in but, as was the case across the afternoon, it just wouldn't roll for the away side as Keane blocked his first effort and Pickford snuffed out the second. Corners a long throws looped into the Everton area in the dying moments, none dropping favourably for an attacker as the Toffees held on for their win, rubber-stamped by Calvert-Lewin's low drive with virtually the final kick of the game. Looking for a return to form, Bournemouth were quickest into their stride on Merseyside and for the majority of the first half were the main aggressors amidst the rapidly changing weather conditions. Had Brooks' shot been a further inch to the right as it instead hit the woodwork or perhaps some more favourable refereeing decisions for a couple of strong penalty shouts, the visitors could have taken the lead their first-half play deserved. The unexpected return of Smith from injury, coming in at left-back and coupled with Clyne on the opposite flank, added a pleasing balance to the Cherries backline. The duo both continually showed their ability to push forwards, giving their home counterparts extra work to do, while always showing their nous to hold their positions in defence, and even showed their tactical dexterity by switching flanks during the second half, encouraging signs for Cherries matches to come.